When Grand Theft Auto hit the gaming scene in 1997, it was an instant smash hit that changed gaming forever. The infamous overhead-view game packed with violence and mayhem left parents protesting and kids with sore thumbs from countless hours of playing. 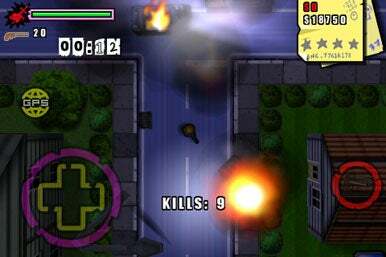 Tag Games has brought this genre to the iPhone and iPod touch with Car Jack Streets, its take on the GTA formula. View to a Kill: Much in the vein of Grand Theft Auto, Car Jack Streets gives you an overhead view of the mayhem going on as you work to repay your debt to the mob. Car Jack Streets puts you in the shoes of Randal Meyers, who owes $1 million to the mob. Mob boss Frankie demands a $50,000-a-week payment, or it’s curtains for Randal (and, by extension, you). Your only friend, Uncle Murphy, has put the word out that you’re looking for work, and you soon start getting offers for odd jobs ranging from delivering pizzas and cab driving to whacking rival mobsters and jacking cars for the chop shop. You play the game in real-time—a week in real life is a week in Car Jack Streets. That means if you put down the game for a week or more, you’ll return to find yourself whacked for missing one of those $50,000 pay-offs to Frankie. I wasn’t sure about this feature at first, but I found that it really immerses you in the game. For instance, I was given a job to protect a friendly gangster who would be leaving the park at 6:00 and when I showed up 2 minutes early, I had to wait for the guy to come out. Also, the game is location—aware—when it’s nighttime where you are, it’s also nighttime in the game, right down to the street lights and headlights on the cars. Jack City is a sprawling metropolis with parks, a marina, a race track, and business and residential sections. There is definitely plenty room to race around in your latest stolen vehicle. From trucks and SUVs to sports cars and street sweepers, there’s something for everyone’s taste—even a helicopter and a tank! Scattered throughout the city you’ll find an array of weapons such as, shot guns, machine guns, flame throwers, grenades, rocket launchers and more. Finding your way around is easy using the onscreen GPS. Just open it up and select a destination; an arrow will guide you to it. Oh, and of course the city is teeming with innocent citizens as well as cops and rival mobsters. The more mayhem you spread, the higher your wanted level—represented by four stars in the upper right of the screen—climbs. Once it reaches four stars, you’ll find cops coming after you from all corners. Luckily for you, along with the weapons around town, you’ll also find disguises to help take off some of the heat. The cartoon-style graphics in Car Jack Streets are nicely done, and the city is rendered in a 3-D environment with an overhead view. The sounds of cars, horns and footsteps as you walk around the city greatly add to the experience. Whenever you’re driving a vehicle, you’re sure to enjoy the radio with its awesome music and realistic DJs. The virtual controls in this game are responsive and easy to use. When driving, you can choose from left and right buttons or a steering wheel. Controlling the car takes a little getting used to but after a while you’ll be zipping around the city without any problems. There is also an auto-correct feature that helps to keep you on the road. Car Jack Streets offers endless hours of fun and gameplay. The only gripe I have comes from the lack of a real save anywhere feature. If you want to quit playing for a while you have to go to Uncle Murphy’s house and exit the game. Otherwise, when you come back, all your weapons and ammo are gone. Still, Car Jack Streets is a must-have for any fan of Grand Theft Auto. It’s a great value at its regular $3 price, and as this review was written, Tag Games had cut the price to $1. Car Jack Streets is compatible with any iPhone or iPod touch running the iPhone 2.2 software update.